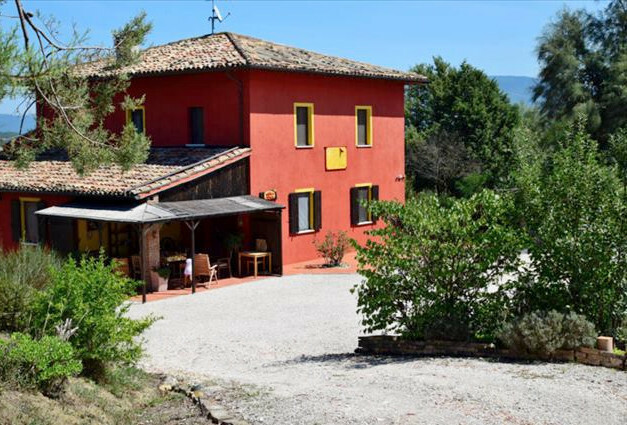 In the heart of this land, not far from Urbino, on the way to Urbania, along Metauro valley, Elizabeth and Paolo will be happy to welcome you in their FOX's HILL B&B, a very nice farmhouse, recently restored, which is on the top of an hill, where there is a wonderful view. Bed and Breakfast FOX'S HILL has got its own independent entrance; all bedrooms are large, bright and cosy, furnished with taste and equipped with private bath. All rooms are tidied up and cleaned from 10.30 to 12.30; linen is changed weekly and, anyway, on every arrival of new guests. You could enjoy peacefully in the dining room below the rooms a rich and wholesome Italian breakfast when the weather is fine, breakfast is served in veranda whit a panoramic view. We offer special conditions for stay over 2 nights. There are many tourist amenities in the region: for example, Furlo Gorge, with its protected area, Sasso Falls, the gullies (Calanchi) (landforms created by running water eroding into soil of argillaceous ground; this unusual phenomenon gives the place a peculiar beauty), Mount Nerone, woods of Cesane. How to forget that we are 35 Km far from Adriatic sea, with FANO, wonderful art town but also famous seaside resort! And PESARO, Rossini's town! When you get to the crossroads Roma Urbino, go on to Urbino, straight to the crossroads Urbania - Fermignano - Go on along the provincial road 4 Metaurense "SP4" towards Urbania. At about 100 meters after the sign "SAN SILVESTRO", near the pedestrian crossing (just before Sidis supermarket), IMMEDIATELY TURN ON RIGHT AND GO ON ALONG THE UNSURFACED ROAD TO THE HILL FOR ABOUT 2 KM.